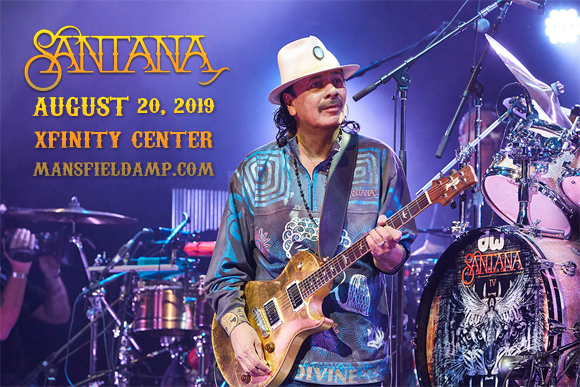 The inimitable Santana comes to Xfinity Center on Tuesday 20th August 2019 on the Supernatural Tour! Celebrating several milestones (the 50th anniversary of their legendary Woodstock performance, the 20th anniversary of the release of their 15-times platinum-selling album Supernatural and the upcoming release of their 25th studio album), the veteran performers have one very special show in store for fans! With all the passion, talent and energy of the early days still very much in play, seeing Santana live is an experience you'll never forget! Lead by world-famous Mexican-American guitarist Carlos Santana, Santana is an American rock band that formed in 1967, in San Francisco and came to fame two years later with a memorable set at the iconic Woodstock festival. The group released its double-platinum-selling self-titled debut album just weeks after the festival to widespread commercial and critical success – the first in a string of hit albums for the band. Throughout the band's 50 year career, they have released 24 studio albums – 17 of which have been certified gold, platinum or multi-platinum. In 1999, after a seven-year hiatus from recording, Santana released Supernatural, their most successful album to date. The record peaked at number one in several countries, earning 15-times platinum certification (as well as nine Grammy Awards and three Latin Grammy Awards), selling nearly 27 million copies worldwide and launching two number-one singles ("Smooth", "Maria Maria"). The group was inducted into the Rock and Roll Hall of Fame in 1998.